It's Saturday, I haven't gone anywhere, and it's perfectly lovely. The past three weekends have been full with guests, and/or going away. It was time to stay home and get some things done. One thing on my list still isn't done - picking the grapes. With the purple ones I'll make and can juice, and we'll eat the green ones. Both varieties are sweet and delicious. I went on a very special outing this week to meet up with two blogging friends. Honora of Pondside and I have visited several times; she lives in town, but Mary of A Breath of Fresh Air lives in North Carolina. She let us know that she would be in town and Honora made reservations for dinner at the Oak Bay Marina Restaurant. How lovely it was to sit at a table overlooking the water and watch the lights on the boats begin to sparkle. Conversation was non-stop and we were some of the last people in the restaurant. Our husbands came along and their end of the table was lively, too. It's the first day of autumn - an auspicious day to clean the house that badly needed attention after the previous weeks. I changed out a few things in the china hutch and re-potted a number of plants. A total of 2 rudbeckia blooms graced my garden this year. I ruthlessly plucked them today and combined them with marigolds and sage leaves for a long, low arrangement on the dining room table. A tidy house is a wonderful thing. Aaah, says my mind and soul. After I took this photo I tweaked a couple of things - do you do that after seeing a photo? After dusting and vacuuming I changed the round blue wicker basket for this more autumnal natural one. I find trays on the coffee table are good for harnessing a number of things - among them the television remote and coasters. There's often a pen or pencil in the basket, too. And so it's autumn. Last night was wet and rainy, today the sun shone, but now, in late afternoon, the wind is picking up and tossing the trees with wild abandon. I'll be linking with Mosaic Monday, hosted by Maggie of Normandy Life. Your puttering results are lovely and I love seeing your beautiful room. What a nice thing to meet blog friends! It's such a great photo of you three. Isn't it amazing how close women can become through blogging? I'm glad you enjoyed the first day of autumn. We weren't in the 90s today for the first time in ages here in Nashville and it was wonderful to have windows open to a cool breeze. We had such a great visit Vee! They picked a really special restaurant and the food was awesome. I am so enjoying catching up with your lovely blog! Thank you so much for your kind comment on my blog. You've been on my mind this week and it was a lovely surprise to hear from you. I have just found your blog, after reading of your meeting on Mary's blog. So many have left blogging, I enjoy finding new ones to follow. Your house is lovely, and I can only imagine how nice it would be to go picking grapes in your garden. I live in Australia, where it is generally quite hot and makes gardening a challenge. Ah Patricia - so glad you came over here to visit Lorrie's always wonderful blog. I hope it will be the beginning of a new friendship - I just know you two will get along!!! Dear Lorrie - love the arrangement in the first house photo showing your interesting shelves adorned with china and glassware. I had seen a photo on Mary's blog - what a lovely occasion, you all look so happy and I can see that you greatly enjoyed yourselves. Rosemary - wish you could have been there with us! Both Lorrie and Honora are so special. Autumn is looking very nice at your house, Lorrie. I love the way that blue vase pops on your hutch. I do like the idea of corralling things on the coffee table onto a tray. Pretty and functional. How fun that you could get together for dinner with two blogging friends. Kim, we need to meet up too - and we are not that far apart so it shouldn't be difficult! I always like to the change dishes on the sideboard. I have a lot of autumn coloured crockery. Your autumn room is looking very welcoming. I have book club coming next week for the first time to our apartment so I'll have to do some tweaking. We read The Women In Gold so I'll go with a few more autumnal accessories. It is a lovely photo of you and the other bloggers. One positive aspect of blogging is that you feel an affinity for people who live in other parts of the world. So nice when you can meet up. I've popped over early to find out more about your wonderful evening with Mary & Honora after reading about it on Mary's blog. What a treat to get together like that. I like the tweaks you've made around the house and completely agree with you about a basket on the table, a place for everything and everything in it's place! Maggie, wish you could have joined us - such a fun time. So happy you, Honora and Mary got together. Mary and I get together about once a year. Your living room looks cozy! . . . . . . and Penny dear, we'll continue to meet up as I always love to see you! Being busy with good things is delightful (like a meet-up with blogging friends! ), but a day spent puttering at home fills the tank! I loved this peek at your living room! It is charming . . . and so reflective of what I know of you. The basket tray is a great idea. I also like a quiet weekend every once a while to catch up on things. And what a beautiful home you have! I love peeking into other people's homes and yours is lovely. Lorrie. I love puttering days and you put yours to good puttering!!!!! Your home is lovely. How delightful to meet with Honora and Mary (two of my favorite bloggers, too). The three of you could be sisters!
. . . . . and I'd be the older sister, haha! Such lovely ladies, so happy to meet in person at long last as we've been blogging for so long! Your living room looks so cozy and fresh, I love the colouring. Autumn is the time to dedicate to house as well. Summer is filled with other stuff.. I’m sure you had a fantastic time with your blogger friends. Your yellow table arrangement is very pretty. Happy MM. Wonderful to meet up with friends and have the delicious time to visit and visit. Gene Stratton Porter!! What a wonderful surprise. I have two of her original books that came through my family and I treasure them so much. Another time ......another place. I love a puttery day and could do with a few more of those myself. I think it is just great that you have met up with some blogging friends for dinner--and how fun the hubs came along and enjoyed each other's company, too. Your living room is just lovely. I am adjusting to living in a much smaller space than we had in the past...it is taking some getting used to at this point. It is great to see lovely Mary! One of the most wonderful ladies I know! So glad you all had a wonderful time! Lovely to spend time with blogging friends. I am loving the beginning of fall and the much cooler days and nights. Autumn comes here with stormy wheater... it’s colder now. Puttering is the best thing to do every! I love your photography and your home. Your home looks lovely and the little stack of tea cups under glass is adorable. We have grapes from the former owners of our property. Three or four different kinds but mostly green. We nibble on them and let the birds have them. I wish they were the dark purple ones; I would love making my own grape juice. We do enjoy how the vines create a little shading area behind the garden. It's a perfectly delightful place to set a table and enjoy a peaceful meal. Here's to happy Autumn days . . . enjoy this beautiful season before the chilly winds of Winter surround us. How wonderful that you was able to meet up with a couple of your blogging friends! And those gorgeous purple (blue) grapes look like they are made of velvet...so, so pretty! Your home looks so comfy and warm. That reminds me that I need to get my fall décor out very soon! I'm such a slacker! You are blessed with a beautiful home. Such a wonderful idea to add sage to an arrangement, it must smell lovely. So nice to meet up with blogging friends and have such a great time. That was definitely a productive session of puttering! Your home is lovely, warm and welcoming. And it does feel so good when everything is clean and sparkly and you've had time to add those small special touches as you did. How fun to meet blogging friends in person. Lorrie, oh how wonderful to lunch with your sweet blogging friends. What a delightful time that must have been. Yes, it's always good to have a day (or two) to re-group. And I love a tidy house - for the 30 minutes it stays that way! I console myself with - if it's clean when the guests arrive, I am golden! Love the look of your grapes!!! How wonderful to enjoy your grapes from your very own arbor, Lorrie. I loved seeing you three blogging friends pictured together. Your hutch looks pretty and your living room looks serene. Yes, I constantly tweak, too! Happy Fall! A lovely post. It must be so special to meet with blog friends because after a time--years, really, they become friends, real friends. Wouldn't a blog reunion be fun. Lover your living room. It looks peaceful. A nice place to come home to. Tweaked or not. And yes, rudbekia are skimpy on the blooms, which with their golden yellow make them a favorite. Isn't it interesting how we look at things differently when looking through the lens. It helps me to see more clearly. How wonderful to visit with Mary and Bob. Your living room is so pretty! Those grapes look oh my delicious!!! Marilyn I wish you could have joined us - Lorrie and Honora are very special women, just like you dear friend. How nice to meet up with some blogging friends, I like that photograph of the three of you. I think Autumn cleaning can be just as satisfying as Spring cleaning! Your room looks very nice. Yes, it is officially autumn...though today it feels quite summery out! Autumn looks lovely on your blog! So nice that you and Honora could meet up with Mary. I love all the blogging connections and friendships. Gosh Lorrie, hope you don't mind me 'bombing' your comments! So many of these lovely ladies I know also and it was so nice to read their comments about our meeting last week. It was a fun time and all over far to quickly. Glad the guys got along too! 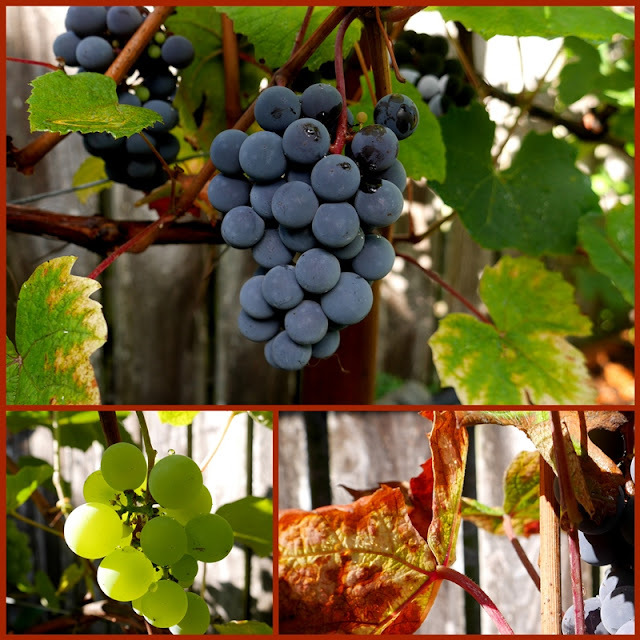 Your grapes look delicious - perhaps you should consider a vineyard, haha! Your rooms look peaceful and elegant - and remind I need to get on with some home projects, SOON! Again thanks for everything - I'm really missing Victoria, such a lovely city.